Yaneer Bar-Yam, H. Frederik Nijhout, Raphael Parens, Felipe Costa, Alfredo J. Morales, The case for pyriproxyfen as a potential cause of microcephaly; from biology to epidemiology, arXiv (2017). 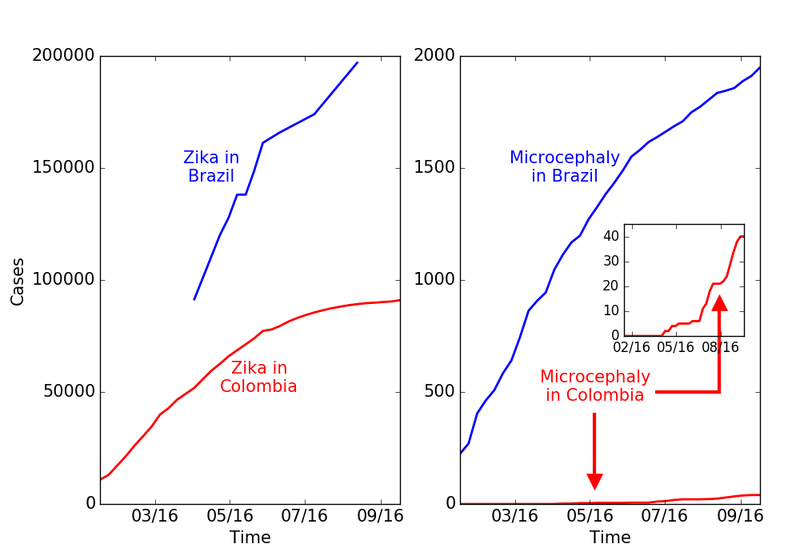 The Zika virus has been the primary suspect in the large increase in incidence of microcephaly in 2015-6 in Brazil. However its role is not confirmed despite individual cases in which viral infections were found in neural tissue. Recently, the disparity between the incidences in different geographic locations has led to questions about the virus's role. Here we consider the alternative possibility that the use of the insecticide pyriproxyfen for control of mosquito populations in Brazilian drinking water is the primary cause. Pyriproxifen is a juvenile hormone analog which has been shown to correspond in mammals to a number of fat soluble regulatory molecules including retinoic acid, a metabolite of vitamin A, with which it has cross-reactivity and whose application during development has been shown to cause microcephaly. Methoprene, another juvenile hormone analog that was approved as an insecticide based upon tests performed in the 1970s, has metabolites that bind to the mammalian retinoid X receptor, and has been shown to cause developmental disorders in mammals. Isotretinoin is another example of a retinoid causing microcephaly in human babies via maternal exposure and activation of the retinoid X receptor in developing fetuses. Moreover, tests of pyriproxyfen by the manufacturer, Sumitomo, widely quoted as giving no evidence for developmental toxicity, actually found some evidence for such an effect, including low brain mass and arhinencephaly—incomplete formation of the anterior cerebral hemispheres—in exposed rat pups. Finally, the pyriproxyfen use in Brazil is unprecedented—it has never before been applied to a water supply on such a scale. Claims that it is not being used in Recife, the epicenter of microcephaly cases, do not distinguish the metropolitan area of Recife, where it is widely used, and the municipality, and have not been adequately confirmed. Given this combination of information about molecular mechanisms and toxicological evidence, we strongly recommend that the use of pyriproxyfen in Brazil be suspended until the potential causal link to microcephaly is investigated further.